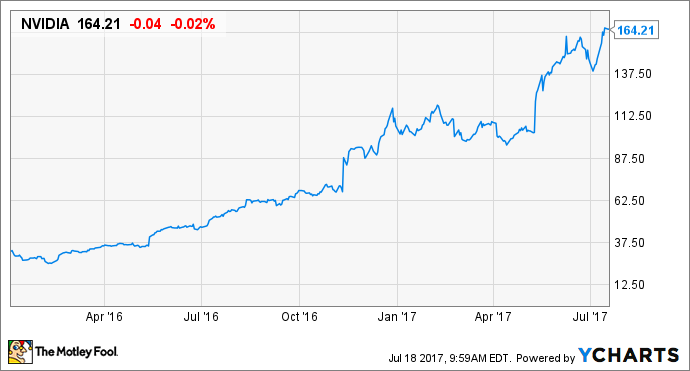 NVIDIA, First Solar, and Inogen are each well positioned to offer investors multibagger gains over the next few years. Investors in Activision Blizzard (NASDAQ:ATVI) have enjoyed market-thumping returns over the last few years. The video game maker's shares have appreciated 236% since the start of 2014 alone, thanks to soaring revenue, earnings, and cash flow stemming from the successes of its Call of Duty, Overwatch, and World of Warcraft franchises. So which companies are well positioned to post similarly rapid revenue and profit growth over the next two years? We asked that question of a team of Foolish investors, and they picked NVIDIA (NASDAQ:NVDA), First Solar (NASDAQ:FSLR), and Inogen (NASDAQ:INGN). John Rosevear (NVIDIA): Activision Blizzard's shares had an up-and-down-and-up-some-more year in 2014 -- setting the stage for a most impressive upward climb afterward. Lately, I've been wondering if we'll look back on NVIDIA's (NASDAQ:NVDA) run over the last year and half or so in the same way -- as the prelude to a much larger sustained period of appreciation. For those who don't know the company, NVIDIA is the leading maker of graphics processing units -- aka, GPU chips. These chips, long popular with makers of video game systems, PCs designed for gamers, and the like, turn out to be uniquely well-suited to handle the intensive data-processing needs of artificial intelligence (AI) applications. That's a market that is expected to skyrocket shortly. Cloud computing, robotics, self-driving cars, any field in which you hear the phrases "machine learning" or "deep learning" -- they all depend on AI. Given that, NVIDIA's addressable market has the potential to be absolutely huge, and the company has already staked out a substantial lead in many of these spaces. It has serious competitors in some of those fields, of course. In self-driving cars, for instance, Mobileye -- which is in the process of being acquired by Intel -- has deeply respected technology, as well as strong relationships with most of the world's automakers. It's not impossible that NVIDIA will have to settle for being second banana in the autonomous vehicle space. But with NVIDIA, we can take a larger view: Even if it only gets a slice of the self-driving car market, along with slices of all of the others, the total pie will be vast indeed. That's why its growth story could be just beginning. Travis Hoium (First Solar): In 2014, Activision Blizzard was a profitable video game company with an uncertain future. Video game consoles were quickly losing popularity as players moved to online games and onto mobile platforms. Of course, we know now that Activision Blizzard navigated those waters extremely well, and has emerged bigger, more profitable, and with better content than it had three years ago. First Solar is in a similarly weakened position today, but there are reasons to believe that it has bright future ahead. Management is investing about $1 billion in its new Series 6 solar panel modules, which will be more cost effective and more efficient than its previous Series 4 generation. And after a slowdown this year that is expected to continue into 2018, the solar industry is expected to return to steady growth in 2019 and beyond as it competes with fossil fuel all over the world. The other big advantage First Solar has is its balance sheet: The company is expected to end 2017 with a net cash balance of $1.5 billion to $1.7 billion. That will give it the capacity to invest in new technology as necessary. The company has talked about adding energy storage as an option, and being in the component business gives it flexibility. If the solar industry returns to growth and consolidates, First Solar will likely be one of the winners. And its Series 6 product line, along with its focus on providing components rather than developing projects, should give it more consistent financials over the long term. Brian Feroldi (Inogen): Since Activision's huge returns were been driven by strong growth in revenue and sales, I think that it is only fitting to look for another company that offers a similar level of growth potential today. Based on that criterion, I believe that Inogen is a fine choice. Inogen's growth hinges on its ability to continuing disrupting the purified oxygen industry. If you've ever seen someone lugging around a heavy oxygen tank with breathing tubes running up to their nose, you are looking at a potential Inogen customer. This may sound like a niche market, but Inogen estimates that 4.5 million patients worldwide need oxygen therapy each year. What's more, this market is growing by 7% to 10% annually as the massive baby boomer generation hits its elder years. In total, Inogen is chasing a piece of what it sees as a $4 billion market opportunity. So how does Inogen differentiate itself from competitors? Rather than force its users to carry about bulky tanks filled with purified oxygen, Inogen created a medical device that creates purified oxygen from the surrounding air. The company's solution is far smaller and lighter than traditional tanks, and can run for up to 5 hours on a single battery charge. This translates into freedom of movement and mobility advantages that legacy solutions simply can't replicate. Inogen's innovative solution has proven to be quite popular, and sales have surged: From 2009 to 2016 its top line grew at a 47% annualized rate. What's more, the company has been solidly profitable since 2012, which is unusual for such a fast-growing medical device company at this point in its life cycle. Wall Street expects that Inogen will be able to continue growing its profits at a 30% annualized rate as it continues to capture market share and expand into international markets. While its valuation is quite high -- shares trade around 85 times trailing earnings -- if the company can deliver on those growth targets, then I could easily see its share price continuing to zoom higher.